CNG has become a friendly name in the fuel industry, however much of its disadvantages are often overlooked. Here we concentrate on the disadvantages that are invisible to the common eye. Reduced performance: Even though CNG is a modern day fuel with less threats to environmental pollution, yet when it comes to the performance side there is a bit lag. 3-4 years used cars starts showing signs of wear and tear as there is a lag in performance. It has also been noticed that the engine performance drops by as much as 10% with regular use for about a year. Also the acceleration is much lower compared to petrol counterparts. Storage issue: As we know, CNG is a gas and as a gas expands more, thus it would require more space for storage. 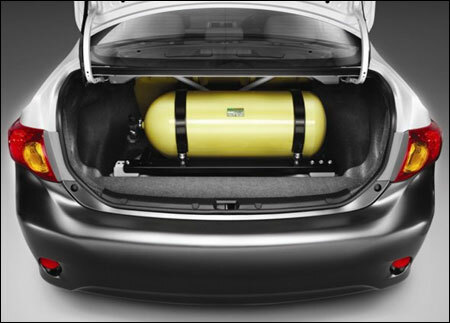 Standard used cars running on CNG have reduced bootleg space due to enlarged fuel tanks. This has been another major problems noticed in such cars. Not so easily available: It is seen that CNG is used in public transports in many states all over India. However this is also a fact that many states are not ready to shift to CNG for their used cars. This is due to an availability issue. Selected cities have a few listed stations which fall on a definite route. Any user not availing this route has to experience a major problem to refill the tank. Thus many leading car companies have avoided using CNG engines keeping this in mind. Issue with engine injectors: When running a newly purchased CNG vehicle it is advisory to first run the car on petrol. Petrol is an excellent lubricant and warms up the engine and the associated motors which ensure a better performance from the beginning. However many owners of used cars prefer not to use this method as petroleum is a bit costly. This in turn hampers the engine. The fuel injectors get dried and blocked and prolonged use in this way leads to wear and tear of the engine. Keeping the tank full- a major drawback: CNG has a lesser range than petroleum and it is quite obvious when concentrated on the cheaper price. As CNG is a gas it can expand thoroughly under low pressure. Thus there is a huge risk of valves bursting. It is therefore suggested to keep a steady flow of fuel in the tanks along with petroleum for lubrication. So a major maintenance issue comes up regarding the fuel tanks of used cars running on CNG. Though there are a lot advantage of CNG over petroleum involving those of being cheaper and less carbon emission, yet as we know the coin has another side too. This emphasizes that CNG also comes with a bulk number of disadvantages. However these are related to the car’s engine and performance and so are not of much concern to us nowadays. But on a long term basis, these issues need to be kept in check. Get the Mahindra First Choice advantage! Check Certified Used Cars in Your City!